When Jack entered her flower shop, all Jen could do was stare. It had been years since she’d seen him, years she’d spent regretting their final quarrel, yet she still felt the same attraction. His heavy-lidded gaze told her he felt it, too. He held out a hand, and she let him draw her close for a kiss that spanned the years. She snuggled into his embrace. Everything would be perfect now that they were together again. “How did you know I was here?” she asked. I enjoyed your 100 word stories. Clever all the way through. Thanks. Here's hoping you'll find time to jump back into the flash fiction blog. I'm signing up in case you do. Pat Bertram's novels, Daughter Am I, More Deaths Than One, and A Spark of Heavenly Fire are available from Second Wind Publishing LLC. In quarantined Colorado, where hundreds of thousands of people are dying from an unstoppable disease, insomniac Kate Cummings struggles to find the courage to live and to love. Her new love, investigative reporter Greg Pullman, is determined to discover the truth behind the red death until the cost -- Kate's life -- becomes more than he can pay. 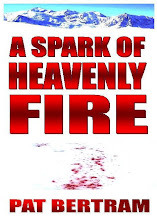 A Spark of Heavenly Fire is available from Second Wind Publishing LLC. Bob Stark returns to Denver after 18 years in SE Asia to discover that the mother he buried before he left is dead again. At her new funeral, he sees . . . himself. Is his other self a hoaxer? A doppelganger? Or is something more sinister going on? Even worse, two men who appear to be government agents are hunting him for no reason that he can fathom. With the help of Kerry Casillas, a baffling young woman Bob meets in a coffee shop, he uncovers the unimaginable truth. 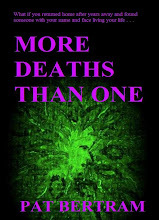 More Deaths Than One is available from Second Wind Publishing LLC. Pat Bertram is a native of Colorado and the author of five books published by Second Wind Publishing. Bertram’s most recent book is Grief: The Great Yearning, a non-fiction book about her first year after the death of her life mate/soul mate. Grief: The Great Yearning is not a how-to but a how-done, a compilation of letters, blog posts, and journal entries Pat Bertram wrote while struggling to survive her first year of grief. This is an exquisite book, wrenching to read, and at the same time full of profound truths. Pat Bertram is also the author of the novels Light Bringer, More Deaths Than One, A Spark of Heavenly Fire, and Daughter Am I. All Bertram’s books are available both in print and in ebook format. You can get them online at Second Wind Publishing, Amazon, B&N and Smashwords. At Smashwords, the books are available in all ebook formats including palm reading devices, and you can download the first 20-30% free!